Last weekend the beer Gods truly smiled on me. 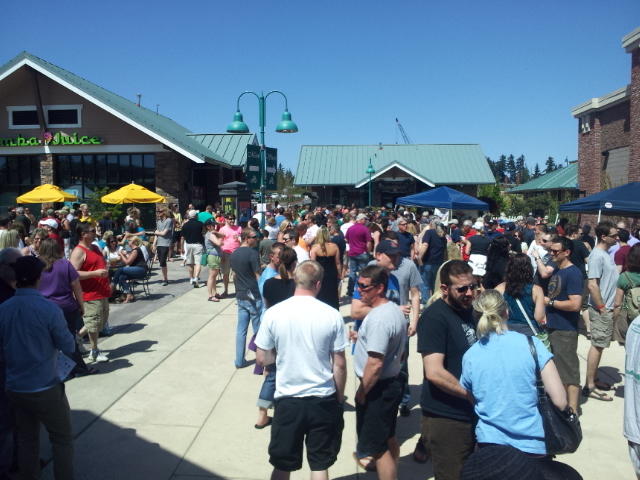 The sky was blue, the temperature was perfect, and the first annual Gig Harbor Beer Festival was held less than a block from my home! Who could ask for anything more? As usual, for the sake of length I will share my top favorites of the day. Local Logger Lager (Everybody’s Brewing, White Salmon, WA) – 4.8% ABV The best beer of the event! Clean and crisp with a honey sweetness. Saaz and Golden hops create a light hoppiness that does not overpower the sweetness. Golden Grahams cereal came to mind immediately. A truly delicious beer! Hulaweizen (7 Seas Brewery, Gig Harbor, WA) – 5.6% ABV A very different beer for this brewery. A lovely wheat beer brewed with coconut water and lemon grass. The pungent sourness of the lemongrass really comes through balancing out the sweetness of the coconut. I really hope 7 Seas makes this beauty one of their permanent beers! Dog Zebra (Valholl Brewing, Poulsbo, WA) – Wonderfully hoppy beer! This lovely IPA had a lot of great citrus flavors and bite. The aroma was like walking through a grapefruit orchard. Wish I had more! Agate Pass Amber (Hood Canal Brewery, Kingston, WA) – 5.5% ABV Fruity and hoppy, this well-balanced beer had notes of honey and pears. Not too sweet, not too hoppy. Great beer for a hot summer day. Autumn Scotch (Der Blokken Brewery, Bremerton, WA) – 7% ABV I love scotch ales, but this one takes the cake! Thick, malty and sweet, Autumn Scotch has an unusual butterscotch aroma and flavor. The body is more on the fuller side and the finish has a “candy-like” sweetness. This is a great beer for kicking back and relaxing. The festival, for the most part, was very well-organized. Unfortunately, the organizers seem to have made the same mistake most first time festival organizers make and misjudged the expected attendance. Most of the brewers were out of beer by 4:00 and the festival still had three hours to go! The use of available space for the festival goers was another issue. The festival surrounded a huge gazebo that had tons of shade. This area was blocked off and not assessable to the festival goers and instead used to store boxes of t-shirts and the token booth (1 guy, 1 table). We were forced to squeeze into what little shade we could find and had to stand as there we no chairs or tables anywhere. I also feel this would have been a great opportunity for the surrounding restaurants to have a small food cart or something in the area. Instead festival goers had to leave the festival, walk to the restaurants, and wait for over an hour for food. I had a great time and, of course, the beer was the best part. With a few tweaks, Gig Harbor should have a heck of a festival next year!